Hey, guys! Our brain is a little scrambled because is it just us, or did the show get super complicated all of a sudden? Like out of nowhere? It reminded us of the first time we got a MacBook and all of the icons were jumping around and we were all, “JUST CALM DOWN, MACBOOK. I DON’T UNDERSTAND WHAT THAT SPACESHIP CIRCLE MEANS.” So maybe we will grow to love this confusing-as-hell story line. Anyway. This week’s episode saw Damon, Elena, Stefan, Rebekah, Bonnie, Jeremy, and Shane on the island doing cure-related things. Meanwhile Tyler, Klaus, and Caroline were resuming their very own love triangle at home. It was not very warm and fuzzy. We hate you, Klaus (but we also love you — never leave us). Ouch. Minus 3 for Stefan offering his hand to Elena and her refusing the help. Although her jealousy is kind of fun to watch. Stefan’s face when Rebekah grabbed his arm around the campfire was ADORABLE. That whole scene was adorable. He was so bemused by Rebekah’s (fake) fear! Plus 4. “If I take the cure, it wouldn’t be for her; it would be for me.” We’re getting a little annoyed with all of these assumptions that Elena is going to run back to Stefan once she’s human, because, c’mon, we’re not stupid. We see what’s going on here, show, and it’s not that. But plus 6 because that was a serious moment of evolution for Stefan. Stefan hates being a vampire — he has since the moment we met him, and way before that, even. In other words: way before Elena. Stefan was totally loving having Elena and Rebekah at each other’s throats. “We get it, you two hate each other,” he said with the HAPPIEST FACE EVER. Plus 3. Stefan having Rebekah pressed up against a tree was really hot. I mean, plus only 2, because would it have killed them to make out? 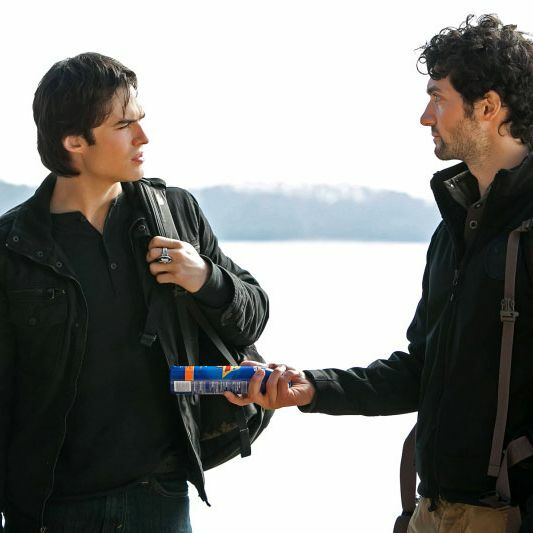 Shane offered Damon sunscreen. “Is that a joke?” Plus 3. “Someone forgot her team-building exercises.” Cute, and also — plus 5 for Elena finally asking Damon what he thinks about the cure. It is totally beyond us how this has never come up before, but it’s Elena, and also they haven’t had much alone time. Let’s be clear that we have no idea how this is going to go, but Damon would actually be the most interesting to see turn human. Think about it. We’ve seen Elena human; Stefan, let’s be honest, is basically already human. But Damon — what would he be like as a mortal? What would he want? What would motivate him? Would his eyes still be so crazy? We need to know. Plus 8 for Rebekah’s comment “You have a nice behind” and for both Damon AND Stefan acknowledging it with their faces. This confirms so much about so many things. Shane’s conversation with Damon was confusing and seemed to zigzag more than Aunt Jenna after a night at the Grill (RIP, Aunt Jenna), but we actually really liked his “I don’t give a crap about Bonnie.” Damon is still Damon, and it doesn’t make him bad, it just makes him him. Plus 3. “I don’t want you to be cured.” Let’s talk about this scene with Elena because it was illuminating for a few reasons. The first is that we now know how Damon feels about being human — he wants nothing to do with it. For himself or Elena. The second is that we’re finally acknowledging that Damon and Elena’s relationship problems extend far beyond this sire bond. They’re still facing what Stefan and Elena were up against — she’ll be mortal, he’ll be immortal. When Damon came out with “That’s not me, Elena; that’s Stefan,” we had to give him credit. It has been — what? — a week in Mystic Falls time since Elena was on the roof with Stefan saying she’d be with him forever. Props to Damon for recognizing that she doesn’t just get to trade brothers but keep all the same life dreams. Damon doesn’t want what Stefan does; it’s out there, and now the question becomes, What does Elena really want? Is it still to be human? I’m not sure we know, yet. Plus 7. Um, does no one ever leave a room on this show? Were we missing something when Elena just claimed Damon might be gone for good? Sorry, D, but minus 6 points for your girl buddying up with Stefan and Rebekah so quickly after that little tiff. We know that was kind of a serious argument, but maybe have some faith, Elena? Plus 10 for Tyler being amazing in that standoff with Klaus. We cannot adequately express how much we adore Michael Trevino, but suffice it to say it’s a lot. When Shane asked if everyone was paying attention, I immediately realized I cannot tweet and watch at the same time. Thanks, Shane! Plus 3! Minus, like, 20 points for there not being a scene with Damon, Elena, Rebekah, and Stefan trying to figure out where to sleep. We feel robbed. Caroline returned! “You are not even worth the calories I burn talking to you.” Plus all the points. Really, plus 5. But they are the most important five we have ever given. Klaus bit Caroline. Not. Cool. Minus 12. Why did Bonnie light that fire? What is even happening here? Can someone leave some comments? Maybe explain Shane and those dudes who kidnapped Jeremy? Was Jeremy kidnapped??? “People put their faith in you because you’re a leader.” Caroline is so wise, and Tyler is so wonderful, and we love them so, so much. Have we mentioned we love them? Plus 9. Rebekah’s point about not hating Elena, and not being the bad guy, deserves a plus 6. Not to get all “this show explores important issues” but, like, this show explores important issues and one of them is how do we define a hero? Our lead characters are kind of the worst. Even THEY acknowledge it sometimes. So, yeah. What makes Rebekah more evil than Elena? She was just looking out for the people she loves. “No, it’s because you were hurt. Which means there is a part of you that is human.” Caroline’s exchange with Klaus was great, especially when she told him that she knew he was in love with her. Also, her dying sounded a lot like Nina Dobrev’s dying. Points for vampire death consistency. Those girls are the best. Plus 8. This show is always good, but we thought the writing was particularly quote-worthy this week. No points, because we’ve already given them, but nice work, writers! Damon admitting the way he really feels about the cure won this round for him. Honesty is always the best policy! We are totally freaked out by all these spoilers for what is coming up in the next few weeks. Promise to hold our hand, k? We have a feeling we’re all about to be devastated. As always — come chat it up with me over at @RebeccaASerle.